As consumers, most of us are disturbed by the inhumane practice of factory farming. Chickens, as well as pigs and other farm animals, suffer much of their lives in cramped, relentless conditions that would make anyone go mad. Yet, the practice of urban agriculture has garnered considerable attention in recent years, and Seattle chicken keepers can ensure that their birds are happy and well cared for while being rewarded with fresh eggs. At least that is the goal for Kristin Baerg’s students at North Seattle Community College. Baerg teaches a class on chicken keeping and urban farming. In addition to being a busy mom of young children, Baerg runs a hobby farm with cows, pigs and chickens in Monroe and shares her expertise in her classes. In her Chicks in the City class, Baerg explains that chicken keeping is a legal, sustainable practice in Seattle and is an easy way to avoid supporting factory farming. The two-and-half-hour class covers topics from chicken breeds to first aid. Up to eight chickens can be kept in yard pens, and Baerg said they take very little time to care for overall. Baerg said that her chickens are raised for meat, as well: “People often asked me how I can eat animals that I know. But I remind them that the animals I raised lived happy healthy lives before it was their time to go. Apparently, animal advocates, egg producers and consumers alike agree with Baerg’s sentiment. Recently, the Humane Society of the United States (HSUS), which advocates for the humane treatment of all animals regardless of their role in our society, made an agreement with the United Egg Producers, an industry trade association, to support legislation to improve conditions in industrial egg facilities nationally. Paul Shapiro, senior director of Farm Animal Protection for the HSUS, said the bill is being considered in the U.S. House of Representatives but has not yet been passed into law. If enacted, the new law would apply higher animal-welfare standards equally to all egg producers. Chickens would be in better environments and have increased room to walk. The goal is to give some relief to chickens in these factory conditions. 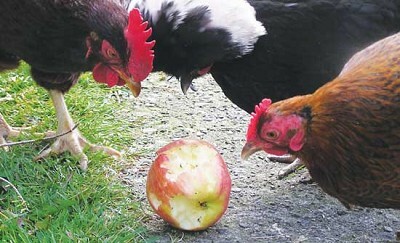 As for keeping backyard chickens, Shapiro said it can be an eye-opening experience. “As long as there are sufficient rules in place to protect chickens from cruelty and neglect, residents get the opportunity to see what beautiful, intelligent and interesting creatures chickens actually are,” Shapiro said. 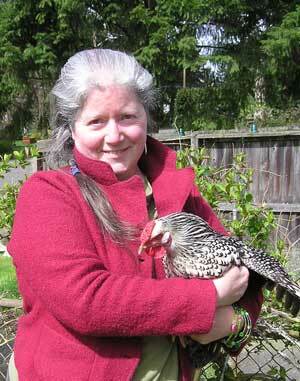 North Seattle resident Mollie Welch reported a similar experience raising hens. Welch is my neighbor, and she cares for five laying hens of all different breeds. Hedda, a white-crested black Polish, frequently roams Welch’s front yard with her sister-hens Honeybee (a partridge cochin), Rhodie (a Rhode Island red), Cleo (a white-caced Wyandotte) and Featherflop III (an Ameraucana hen). “It’s a family name,” Welch explained of the last hen. Featherflop I and II have since passed on. Welch has enjoyed her chickens for about a year. She brought them home from Portage Bay Grange, a supply store that offers chicken, rabbit and goat feed for urban animal keeping here in Seattle. Now, the flock produces seven to 12 eggs a week, ranging in color from delicately brown-spotted from Honeybee to soft green from Cleo. Welch learned chicken keeping from a variety of sources, and recently had to care for a wound on Hedda’s head. An anti-pecking compound turned Hedda’s head feathers purple giving her a punk-rock look for a while. But otherwise Welch’s first aid was successful. In the driveway is a cedar chicken coop with laying beds and a free-run area. The chickens are secured in the coup and safe from predators when Welch is away. But the walk from the coop door to the front gate is a familiar one for the chickens. They know the way, waiting for Welch to open the gate and begin their afternoon foraging in the front yard. “I really enjoy them,” Welch said, as her chickens scratch around the garden for a dirt bath. And as for friendly Hedda, Honeybee, Rhodie, Cleo and Featherflop III, the feeling appears to be completely mutual. For information on Baerg’s Chicks in the City class, see the North Seattle Community College Continuing Education website. Urban-farming classes are also available through Seattle Tilth (seattletilth.org). For more information on advocacy for farm animals, visit the HSUS website at www.humanesociety.org. CHRISTIE LAGALLY is a freelance pet columnist who writes the blog “Sniffing Out Home: A Search for Animal Welfare Solutions” at www.sniffingouthome.org.